I had been meaning to check this place out for a while now. Originally a started as a breakfast store, born out of that is this soup dumpling restaurant specialising in steamed loofah and pork soup dumplings. The menu is fairly extensive, but you can see what our picks were. Pick whatever you want out of the fridge and they will add it on to your total at the end of the meal. I picked up a plate of stewed bitter gourd (bottom right of the shot) which had some chilli in there with some of the mini fish (see below), and also a plate of the pickled bamboo (middle of the shot). These were mega, there’s no doubt about it. 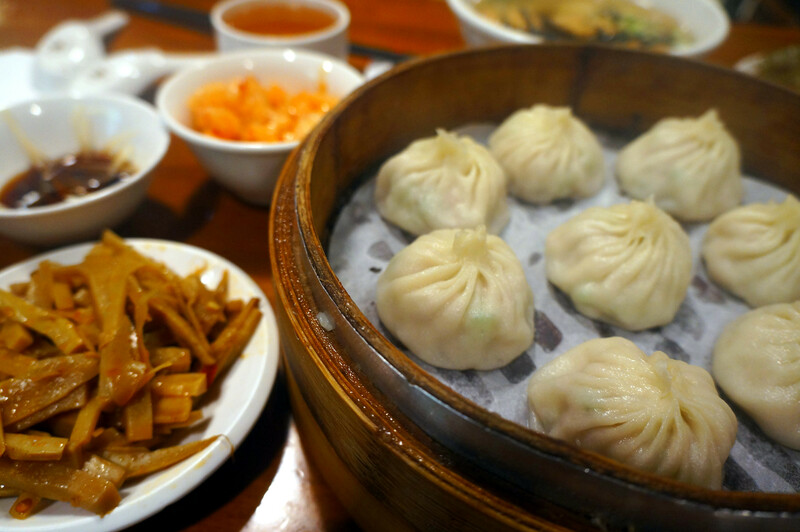 The bar is set really damn high for steamed soup dumplings in Taipei, with DinTaiFeng leading the way head and shoulders above the rest. The skin on these was slightly thicker than DinTaiFeng, but what makes these really special is the unique filling inside – Loofah 絲瓜. Now, this vegetable is a weird one, I’ll be honest. It is part of the cucumber family, and I often dislike the gloopy soups I usually see made from loofah. All that aside, though, the loofah really works inside here with the pork filling. It remains crunchy, fresh, and full of flavour. There’s not a huge amount of soup on the inside of the dumpling, but that doesn’t really detract from the flavour, for me. I haven’t eaten this in so long, that I needed to order it. In actual fact, this is probably the only other thing on the menu that I would order again (as well as the soup dumplings). A thin pancake is sandwiched with sweetened red bean paste and crusted with sesame seeds, then baked – win. When done right, this sesame paste/pudding is really something to behold. If done right, it is silky smooth, slightly thick in consistency, and packing an incredible sesame aroma. This didn’t step up to the plate, here, and I won’t be ordering it again.